Most of you know that I’ve done YouTube videos about my Bipap or the “Meet Christine”, right? If you’d like for me to make another one, I’ll do a Q&A video if you send me your questions. They can be about me or about oxygen or just silly stuff. Keep them clean questions. Just message me or email your questions at goredrider@gmail.com when I get enough for a video, I’ll make one. Sound like fun? I finally figured out what I wanted to do with the 3 large lemons my dwarf Meyer lemon tree produced. What’s better than freshly squeezed lemonade? It was so delicious! If only my tree grew more than 3 lemons! I made lemonade from the lemons I grew! Here’s the updated picture of my January’s Need a Hug afghan. Get yourself on the list of recipients if you feel in need of a hug because you’re having a tough time breathing. GO Broncos!!! Need I say more? hehe! Yes, I’m supporting Peyton Manning for the Super Bowl. I’ll be attempting more gardening this year. K is building me a raised garden bed that will be about 16″ high. The size of it will hopefully end up being 2’x 6′ and 16″ tall on the ground. I’ll be growing potatoes, Bibb lettuce, cilantro, and spinach this time. Also, the chives and basil are what I grow every year. I hope like crazy that I’m successful and that it doesn’t make me too tired. K is going to build this extra garden next to the tall raised bed. That way my oxygen tubing will reach just fine. He’s so thoughtful. He had to move all my half whiskey barrels to make room. Aww… he’s so sweet. He loves me but this is his way of trying to get me motivated and outside so that I don’t become sedentary which would make my lungs weaker. I don’t need them any weaker. Trust me on that. erg! I’ll take pictures of the garden progress and blog about it! It will be fun! So send in your questions and I’ll try to answer them. Think of it as a way to get to know me and remember, no question is a dumb question. If I can answer it, I will. Just keep in mind that I’m not a doctor. My answers are based on my experience during my life. Have a great week!!! I think everyone knows by now that I like doing silly things or creative things to keep myself in good spirits. I try to share these things to help others feel happy too. 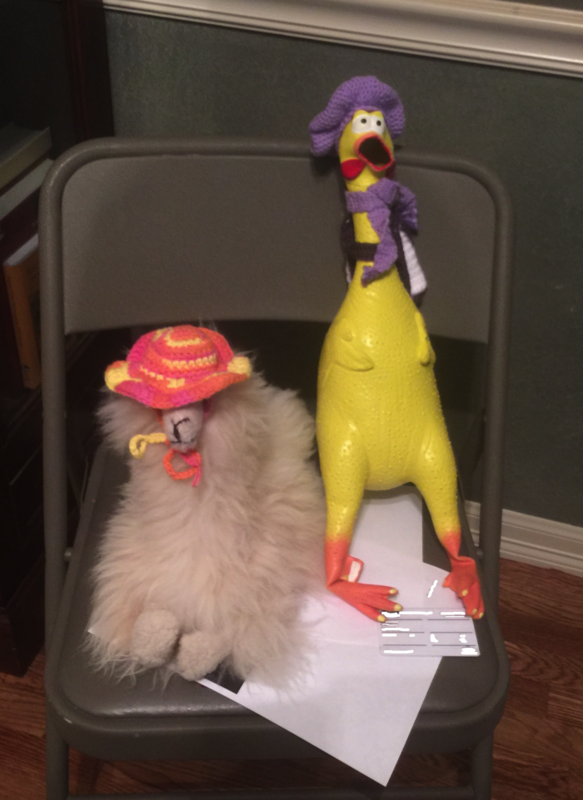 For those of you who don’t know who Klondike is… Well, he’s K and my road trip mascot who happens to be a rubber chicken (don’t laugh.. we take this pretty seriously! haha!). He really is pretty darn cool. Not only that, he brings us good luck and a safe journey to wherever we go. This year Klondike has the opportunity of a lifetime. Who wouldn’t want to go to Paris, France? I know I do! However, with my breathing problems, I can no longer fly. So, my younger sister offered to take Klondike with her and her husband to Paris. They will take pictures of Klondike enjoying Paris and send them to me. It’s their way of helping me enjoy Paris too. They leave later this month. Last month, I got really busy preparing the things that Klondike will need for his journey… things like: a passport (teeny tiny size! ), a French dictionary, a beret, a scarf, a backpack, faux money in a tiny wallet, a fun map of Paris folded like a Rand McNally map, a letter of consent for traveling with my sister, and even a little, tiny journal (with the first entry in it as Day 1) made from the banana paper she gave me from one of her vacations. Well, I think that’s everything. If you want to see some of those things, see my post here. I’m pretty excited because Klondike has already made it to Oklahoma which is his first stop on the way to Paris. He’s already made a new llama friend. Klondike loaned him his beach hat! Wow! He also learned how to play the clarinet! My youngest nephew taught him how. It really sounds like Klondike is having so much fun already. Here’s a picture and a video for you to enjoy. haha! Klondike met a new friend llama from Peru! He’s wearing Klondike’s beach hat! You probably think I’m nutty for doing this but, honestly, sometimes I just need something exciting to look forward to. It helps me keep a smile on my face. Maybe I went a little too far with all of Klondike’s “belongings” but heck, I’m having fun. Pretty soon, I will be turning 46 years old and on that same day, K and I will be married for 23 years. I started dating him when I was 19 years old. So, that means we’ve been together for 27 years. That’s a pretty big accomplishment! haha! With my birthday coming up, I will get my “Week of Princess” treatment. I can’t wait! K is so sweet about it. I get to use the phrase…”but it’s my birthday” a lot and it even works! haha! Ok enough for now. You all keep safe and stay well. *big hugs* to you all! Before I started taking medicine for Pulmonary Hypertension in 2006, K and I would go dancing. We’d only go to a dance club for about 2 hours, which is about how long my energy would last from dancing the whole time. Plus, there were smokers in the dance club and that bothered my breathing. I love to dance. Granted, I’m not that good at it and it is REALLY hard to dance with my portable hanging off my shoulder or sitting on the dance floor at my feet. But I did it because it made me SO HAPPY to get out and have fun even though it made me tired and that I could only do it for 2 hours. I still dance at home just to have fun and also to make K smile. Songs can change moods. They can lift you up or drag you down depending on the song. I try to stay away from sad songs. I don’t have many songs on my phone but there are some songs that are those “feel good” songs… and this one is like that. It expresses how I feel for K. I hope you like it too. Now get up and dance along!!! Love to you all..!! How to adjust to using them. How to breathe when you have stuffy nose. How to qualify to have a bipap. These are just a few of the questions I’ve tried to cover in my blog. Today I put together another video for your viewing pleasure! This one covers the bits and pieces of a bipap machine and the parts to order from your Durable Medical Equipment company who prescribed the bipap machine for you. You can request these replacement parts every 6 months but be sure you check with your insurance company just to make sure that this is their policy too. Ask if there is a co-pay for ordering these parts. This video is twice as long as the first video I did a few days ago only because I wanted to explain various parts of the bipap machine itself. But this video, I didn’t film in HD quality. It still looks good though! Yea me! I hope you like it. I’m kinda getting the hang of it and I’m starting to enjoy them.. hehe! Here’s the video for you. I’m pretty goofy in it but enjoy it anyway!!! http://youtu.be/poPtM5GnXzA It’s about 18 minutes long. Enjoy!! Hold on to yourself… I’m about to try something very different. This time I’ve done a video. You can see me in my house and all without makeup! OHMYGOSH! I know… I don’t know how I feel about this but I thought… What the heck! Why not just try? I like a good challenge! YEA ME! So, if you don’t mind sitting through an almost 8 minute video, then, you too can see how I look and act while talking with you. I did this without notes! Now, I’m not going to do the videos for every blog post. Good gracious no! But every now and then I might pop up a video just to surprise you and keep you on your toes. haha! Have a great day everyone. *hugs* to you all! http://youtu.be/Y2N-qO7Tftk here’s the link to my video. I hope this work this time!